The Inn has several welcoming places to curl up with a book or loved one. The cozy warmth of this whimsical getaway creates a retreat of peace and quiet. 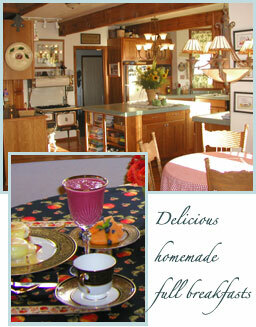 Breakfast is a memorable event with China, crystal, sterling, fine linens, flowers, candles and soothing music. Delicious homemade breakfast includes meats from the local butchers, as well as entrees with home grown fruits, berries, herbs, and edible flowers. Complimentary beverages will always be available. The great room has an attached library with a one of a kind stone fireplace, beamed ceiling, leather furniture, braided rugs, and a bay window framing the panoramic view of the Olympic Mountain Range. Wireless internet is available throughout the inn. Glory accommodates two guest and is decorated with warmth, imagination and much detail. It features a private balcony where you can sit and enjoy the panoramic view of the Olympic Mountain Range, a gas fireplace, private bath, luxurious beds and linens, sitting area, TV, fresh flowers, candy and bubbles for the bath. 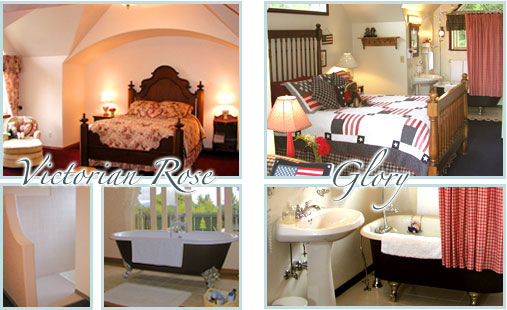 The Victorian Rose is a spacious suite with queen bed, large sitting area and table, walk-in shower, clawfoot tub, and HDTV. Rollway cots can be provided.